Greeting guests from the balcony of the hotel lobby, a 1930’s “shadow” orchestra set the tone for a chic, fun evening. Downstairs, using the textural inspiration of the period, RSP used glass and metal to transform the Grand Hyatt Ballroom into a 1920's cinema foyer & interior. Large panes of geometric printed and back-lit glass, metal filigree walls and towering statues creating a party for the eyes made of the same fun and fantasy that excited party-goers back in the 1930’s. 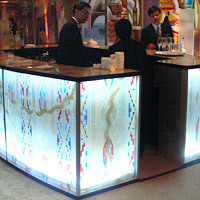 Six metre tall gold statues, metallic table centrepieces and stained glass wall panels completed the transformation. A 1930’s style “Jazz Moderne” orchestra accompanied by singers & dancers in the fashion of the era entertained the guests dialled up the style. Pearl, the traditional gift to mark this celebration was teamed with crystal for an enchanting set-up. You can see the official photographs here.